There’s a time and a plaice for everything! 1. Preheat the oven to 200°C/gas mark 6. Line a baking tray with non-stick baking paper. 2. Place the fish on the lined tray, season with a pinch of salt and pepper and bake in the oven for 8 to 10 minutes. 3. Meanwhile, to make the pesto, place the rocket, pine nuts, semi sun-dried tomatoes, lemon juice and oil in a food processor and pulse until the ingredients have blended together. 4. 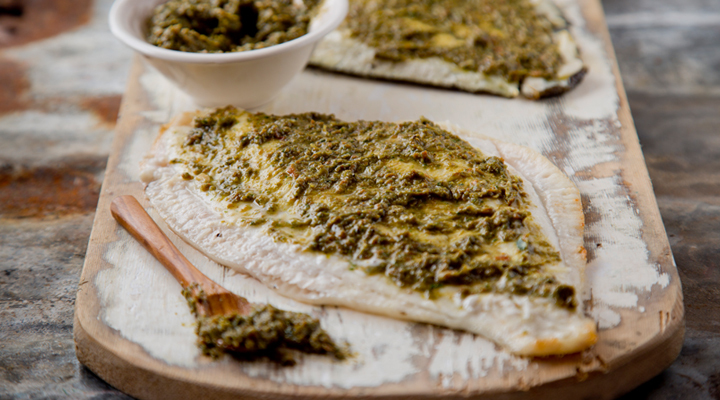 Remove the fish from the oven and drizzle with the pesto. Serve with boiled baby potatoes on the side. Close your eyes and you could be in the Med! Tip: Get your friendly fishmonger to put the fish in ovenproof bags to make this even easier to bake at home.